Situated in Jackson County in the southwestern part of the state, Medford is quite a large Oregon city. It's home to an estimated total of just over 81,000 people, with more than 217,000 in the full metropolitan area, which is the fourth biggest in Oregon. Founded back in the late 19th century by an Oregon and California Railroad civil engineer named David Loring, Medford is conveniently located by the middle ford of Bear Creek and has proven to be a hugely popular spot for outdoor recreation and nature enthusiasts. The city of Medford is home to various parks like Alba Park, Bear Creek Park, Don Jones Memorial Park, and The Commons, with lots of big open spaces and landscaped areas that people of all ages can enjoy. It's an ideal spot for those who love to spend time outdoors, breathing in the cool fresh air and enjoying the beauty of the Oregon scenery that surrounds them. The city of Medford, OR is also home to the historic Medford Carnegie Library, the fascinating Crater Rock Museum, and the ever-lively Craterian Theater. Whether you're a history buff, a live entertainment lover, or an outdoor enthusiast, you'll find a lot to love about this Oregon city and there are plenty of highly rated RV parks to check out in the area too. Staying in an RV park in Medford, OR is a great way to enjoy the city's unique attractons and explore the local area too, with many RV parks in Medford offering great rates and useful amenities of all kinds. See below for full details and contact info for all the best RV parks in Medford. Located just south of Downtown Medford in a quiet and calming spot, the Holiday RV Park in Phoenix, OR offers quick and direct access into Medford for all of the city's stores, restaurants, landmarks, and attractions, while also providing a cozy and easy-going environment to retreat to in the evenings or at any time of day when you just feel like resting up and enjoying some peace and quiet. Ranked very highly by countless past guests, this Medford RV park is definitely one of the best places to choose if you're planning either a short or long term stay in the city of Medford, OR. Holiday RV Park is a family owned and operated location that has been serving the Medford area since 1986, with the Parducci Family management team offering wonderful welcomes and big smiles to all guests. The RV park is right on Bear Creek and nicely positioned for various outdoor activities, as well as being a good place to base yourself for trips to local cities like Ashland too. This RV park features over 100 individual full hook-up spaces with 20/30/50 amp power, cable TV, Wi-Fi access, and more. The park also features a heated swimming pool, BBQ firepits, game courts, picnic tables, a general store, and storage facilities. Located just a few minutes north of the city, Southern Oregon RV Park is another excellent RV park location in Medford, Oregon. As the name of this RV park suggests, it's a great place to base yourself for exploration of Southern Oregon, with a lot of beautiful natural areas, interesting historical towns, and fascinating landmarks to be found within an hour or less. For those just wishing to visit Medford, Southern Oregon RV Park is a great place to stay as well. One of the best things about staying at this Medford RV park is its affordability. You'll only have to pay $38 per night for a stay at Southern Oregon RV Park, which is definitely one of the best rates in the city. If you have a larger RV, you may have to pay a $2 extra nightly fee, but this is still a very affordable option, and the spaces at Southern Oregon RV Park can cater to RVs and motor homes up to 75 feet in length. There are more than 90 full hook-up spaces to be found at this Medford RV park, with the on-site amenities including 20/30/50 amp power, picnic tables, firepits, wireless internet access, clean restrooms, hot showers, concrete walkways, direct access to Bear Creek, two catch and release fishing ponds, a dog park, and more. One of the primary reasons most people choose to visit Medford, Oregon or the surrounding area is to get away from their city lifestyles and enjoy some fresh air and wide open spaces. That's exactly what you'll find at Medford Oaks RV Park. This RV park is located just a short drive northeast of Medford itself, in a very quiet and picturesque location set across 27 acres of beautifully landscaped lands. Offering spaces for both tents and RVs, as well as private cabin rentals, this RV park and campground is a great place to stay and enjoy the natural beauty of the Medford area. 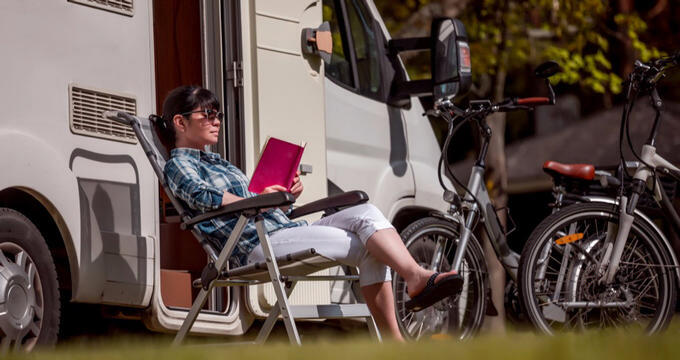 Medford Oaks RV Park offers big rig friendly RV sites, so you won't need to worry about your motorhome being too large to fit in at this location. On-site amenities here include a catch and release fishing pond fully stocked with several species, a spacious recreation room with all sorts of video and table games to enjoy with your friends and family, a huge picnic area with its own BBQ grill, free wireless internet all around the park, lots of outdoor game courts and spaces, a seasonal swimming pool, private showers, clean restrooms, a gazebo that can be rented out for parties and get-togethers, and even a general store selling useful items for every occasion.